In Margaret Atwood's apocalyptic novel Oryx and Crake, a mad scientist engineers a race of pseudo-humans who are the ultimate good guys. These "Crakers," as they're called, feel no jealousy. They have no aggression. Their physiology allows them to live in perfect harmony with nature. And they're such dull company that the lone human survivor of the apocalypse would rather risk being eaten by feral mutant pigs than keep these people around as bodyguards. The Crakers' biggest problem is they're so doggone nice that they're incapable of humor. "For jokes you need a certain edge, a little malice," their fictional creator says. "It took a lot of trial and error ... but I think we've managed to do away with jokes." Does goodness seem bland because villains have the monopoly on irony, wit, sarcasm and irreverence? 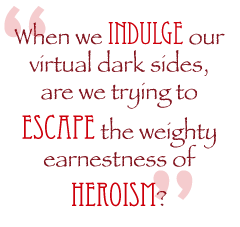 When we indulge our virtual dark sides, are we trying to escape the weighty earnestness of heroism? Villainy's "fun factor" is an issue more pronounced in art than in real life. We usually don't mind sharing an office or a fence with a nice person, but we don't particularly want to read about him. In the case of roleplaying games, dialogue writers face an even greater challenge than novelists in making the "good" choices as interesting as the "evil" ones. Consider, for example, the scene that opens Jade Empire. You're standing in the ring with one of your fellow students at Master Li's school. "One of these days," says your cheerful sparring opponent, "I'll find a way around your guard." If you're determined to be nice, your choices are a good-natured "One more match, then?" or a terse but polite "Not today. We're done practicing for now." If, on the other hand, you're in the mood to play a conceited jerk, the responses are funnier: "I could blindfold myself. That might even the odds," you can say, or, "I doubt it, you strike with the grace of a cow." Not comedy for the ages, sure, but more amusing than the choices permitted to a sincere, earnest bore. Thanks to the structural constraints of text-based player responses, Chaotic-Evil roleplaying choices are much more likely to involve wit or irony than their Lawful-Good counterparts, due to the standard dialogue tree's limited scope. Ideally, an RPG would allow players to choose from a whole spectrum of personalities, but in practice, each tree can support only so many conversation paths and character nuances without devolving into an unmanageable labyrinth.